You're right it does seem early to be thinking of Christmas but the team at Make My Monday are asking for a Christmas card for their challenge this week. I suppose if you have lots to make it does make sense to start in good time rather than be in a last minute panic. I've used an image (layered onto Spellbinders circles) and backing paper from Docrafts, the sentiment was printed and cut out using a Stampin' up punch and the fir branch and poinsettieas were cut out using Marianne dies - a little gold glimmer was added to the flowers.There you have it, my first seasonal card this year and if you need the impetus to make a start on yours it is worth taking a look at the inspiration from their design team. A beautiful card Val, and not to early for Christmas. I really should make a start on mine, this time last year I had about 30 made, this year 1. You're ahead of me! That lovely delicate frame in the green around your circular image panel is striking in the way it accents the holly shapes of your background paper & I love the effect of the poinsettias. 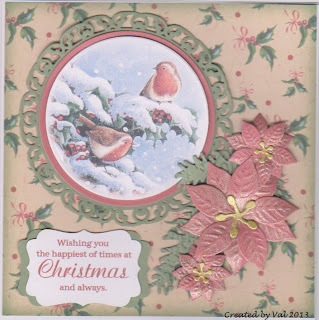 I love the delightful image on this lovely Christmas card Val, thank you for joining us at Make my Monday. This is an absolutely gorgeous card, - I really admire people who can think that far ahead, I usually start mine in October..... anyway, well done you, like you say, if you have lots to make, it pays off starting early, much more enjoyable than being in a rush! Wonderful Christmas mood on your card! Love it! Gorgeous card Val - haven't even thought about the dreaded C word yet! Must admit that DoCrafts have some great Christmas stuff and I was excited to hear yesterday that I've won their monthly club giveaway for June.......can't wait to see what arrives! This Christmas in July card is just beautiful with the poinsettia's. Whoever receives it will love it.